We are the manufacturer, supplier and exporter of Freeze Dryer For Research in Chennai, Tamilnadu, India. This product has been supplied to Research, Laboratory, Institutions and other Research Oriented Industries. 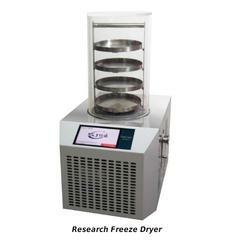 We are offering wide range of Research Freeze Dryer to our customers from all over India. Our product details are following. 3 Liters in 24hours ice capacity. Internal condenser coil-304 or 316 stainless steel. -50C or -80C condenser lowest temperature. 304 or 316 stainless construction. Heating element to defrost available for optional. Transparent Acrylic Drum drying chamber for user to observe the drying process. condenser temperature, run time, ambient temperature. 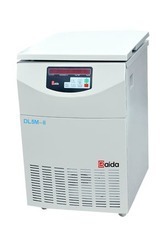 For water based samples, the -50C condenser is the perfect choice with effective cost. For samples containing solvents or with low eutectic points, the -80 C condenser provides maximum performance. For labs that need quick turn-around, Heating element to defrost available. General type: Specially designed stainless steel sample holder, adjustable sample tray spacing, number of layers set free; drying plate diameter 200mm, a total of four; material can be placed approximately 1000ml (material thickness 10mm).